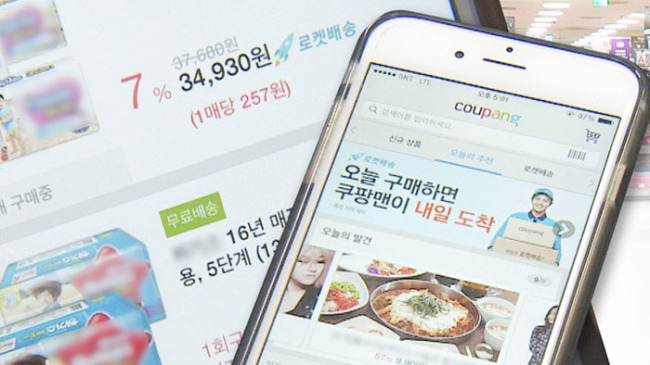 Purchases made using the Internet and mobile devices in South Korea continued to show solid growth in June, government data showed Thursday, demonstrating the popularity of smartphones, fast delivery and convenient payment options offered to local shoppers. The total value of transactions made with computers, smartphones and tablets reached a record 8.72 trillion won ($7.79 billion) in June, up 19.6 percent from a year earlier, according to the data from Statistics Korea. The sharp rise was attributed to increased demand for electronics, daily necessities and food, the agency said. The total value of mobile transactions soared 32 percent to 5.42 trillion won, accounting for 62.1 percent of all online purchases in June. Mobile purchases in South Korea have been on a steep rise for years as smart devices expand their presence in the world's most wired country and rapidly replace computers as the means of conducting online transactions. South Koreans' direct purchases from foreign countries surged 29 percent in the second quarter of the year compared to a year earlier on rising demand for cheaper and different products. Foreign goods worth 687 billion won were bought by South Korean shoppers via overseas Internet shopping malls during the April-June period, the data showed. Foreign garments and fashion items were the most popular with local consumers, resulting in 241 billion won worth of purchases, followed by foodstuffs valued at 158 billion won, the data showed. The United States was the biggest seller, accounting for 365 billion won of the sales. Europe came next with 137 billion won, followed by China with 119 billion won. The data also showed that online sales to foreigners moved up 56 percent on-year to reach 894 billion won in the second quarter.